Click here to view a time-lapse video of the installation taken by Seth Bossingham, PVM senior web developer. The Lynn Hall collection of artwork continues to grow with the addition of the "Guardians of the Bond" bison. Created as part of the Indiana Association of United Ways' statewide "Bison-tennial" Public Art Project developed in partnership with the Indiana Bicentennial Commission, the five-foot-tall fiberglass sculpture was created in honor of the state's 200th birthday. Sponsored by the College of Veterinary Medicine, the sculpture's design, painted by Elizabeth Lincourt, of West Lafayette, features a rural Indiana scene with animal tracks superimposed along with several words from the "Veterinarian's Oath" and the message, "We're all on this path together." The sculpture was previously displayed on Memorial Mall near the intersection of State Street and Oval Drive along the Indiana Torch Relay route, but has now found its permanent home in front of the Veterinary Pathology building. Purdue University Mason Shop staff took advantage of a break in the rainy weather on Tuesday (April 4) to install the bison. 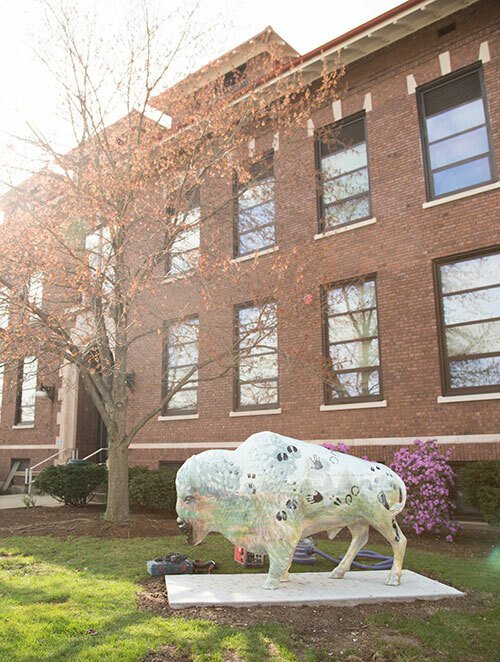 The "Guardians of the Bond" Bison-tennial bison was permanently installed in front of the VPTH building on Tuesday, April 4.